Weddings Costs > How Much Does an Engagement Ring Cost? How should an engagement ring cost? On average, the engagement ring cost can be anywhere from as little as $200 to as much as $20,000+. Like any jewelry available out there, the sky is the limit. A quarter carat or less set in a diamond can cost anywhere from $100 to $600. A half carat diamond can cost anywhere from $500 to $1,100. Diamonds that are up to .75 carats can cost anywhere from $1,000 to $2,500. Diamonds up to 1 carat can cost anywhere from $2,400 to $4,000. 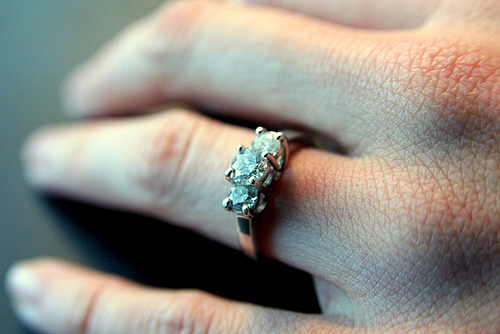 The average American today will spend anywhere from $3,000 to $5,000 for an engagement ring. This price will really come down to the buyer’s personal expenses. Someone that has a large monthly student loan and rent payment may not be able to afford something as high as $3,000, while someone that has no bills and a higher paying job can afford the larger ring payment. MyJewelryBox.com, a popular low-cost jeweler online has a large selection of engagement rings. On their website, the prices range anywhere from $70 to as much as $17,000. On average, though, most of their best sellers cost anywhere from $350 to $2,000. According to LoveToKnow.com, the average cost of an engagement ring in the United States is $3,500-$4,000. This price depends on a few different factors: the carat, or size of the diamond; the cut, or shape of the diamond; the color, such as pure white or pink; the clarity, or how clear or flawless the diamond is; the setting, such as the use of prongs to hold the diamond; and the design, such as a solitaire. The price of the diamond per carat can vary even by .001 of a carat. This price does not only cover the center stone, however; it also includes any side stones in the design. The smaller the total carats, the cheaper the ring will be. For example, this Solid 14kt White Gold Solitaire Ring retails for $200 to $420. This 3/4 CT Diamond Solitaire ring retails for $600 to $2,000. The cut of the diamond will affect the cost based on how difficult the cut is. More common cuts such as the emerald or princess cut are much cheaper than heart-shaped or oval diamonds. A pure, colorless diamond will be cheaper than the rare pink, yellow, or blue diamonds. A flawless diamond is very rare, and will, therefore, be more expensive. Diamonds with slight flaws, however, can be treated to make these flaws less visible. Most of the flaws would not be noticed by the naked eye anyway. A setting which employs prongs is the cheapest type of setting. Tension and bezel settings are the most expensive. The design of the ring, depending on how elaborate, can affect the price. Something simple like a diamond solitaire will be the cheapest. What kind of budget do I have today? Do I have a large mortgage? Car payment? How much do you both make combined? Are you comfortable spending three months of your salary on a ring? Remember that this is just a “rule,” and you don’t have to follow it. With the jeweler you’re purchasing from, what kind of reputation do they have in town? Is it a well-known jeweler located in the mall? Is it a mom and pop venture? Each one can have their own advantages. What does the soon-to-be bride want in terms of a ring? Does she want something large? What kind of cut does she want? Try to get these answers subtly. How are you going to pay for the ring? Cash? Credit? Don’t fall for the old saying that states that you need to spend more than two months salary for a ring. This just isn’t true anymore. It’s wise to invest into a ring that you both can afford. Many nice engagement rings can be purchased for less than $1,000. Be sure to study your budget. If you’re going to drop $7,000 on a ring, can you use for other investments such as a home down payment, student loans, etc? Know your “Four C’s” when purchasing an engagement ring. This will include the cut, color, clarity and carat. As noted above, each “C” can greatly reflect the price tag. If you would like to design your own ring that a jeweler will make for you, this will be much more expensive than choosing a ring that has already been made. Some jewelers charge extra for sizing, while others will include this in the price. Because an engagement ring is considered an investment, insurance can be purchased. This insurance will cover the cost of the ring in case it is misplaced or damaged. If the diamond is ASG/GIA certified, this can increase the price by more than 15%. Shopping at a high-end store such as Tiffany’s will cost between $9000-$13000. Shopping at a discount jeweler such as Jared will cost more like $1000-$4000. You can also find various rings online via Amazon as well. Talk with a family member to see if there’s a ring that can be passed on down. Not only will this be a cheaper alternative, it can have sentimental value as well. Consider checking local pawn shops or antique stores. These type of shops can have a rather big selection in terms of jewelry. Consider a ring with a few smaller stones, rather than one with one large one. Many jewelers know that most can’t plop down a $5,000 payment for a ring. With that being said, most offer lines of credit or credit cards. Consider financing options if the interest rate is low enough.